I’m just back form a cruise on Portugal’s beautiful river Douro. I have had two excellent European river cruises with ‘Amadeus’ in the past, but I decided to try a different cruise line – Amadeus do not operate on the Douro anyway. However this time I picked the right river, but the wrong cruise line! I am in the process of writting a warts-and-all review, but it will probably take me a week or more to complete. Please watch this space. It should prove enlightening! The AMADEUS STAR will be the next highlight of the Amadues river-ship fleet from May 2019. Similar to our other ships, the AMADEUS STAR cabins on the Mozart and Strauss Deck also feature lowerable panoramic windows which extend across the entire cabin front and have been specially designed for the AMADEUS ships. There are now a multitude of river cruise lines, cruising Europe’s waterways. ‘Viking Cruises’ are the biggest and have the strongest media presence, but I decided to cruise with a lesser known line. I chose ‘Amadeus River Cruises’, which was formed by the Austrian ‘Luftner’ family, 30 years ago. Why? Because they offer a five star (well maybe 4.5) product, but their fares are lower than many of their rivals. (Although it is important to compare what is and is not included). Amadeus at the time of writing (April. 2019) has thirteen river boats cruising in Europe. More are being added to the fleet. The American Cruise Lines has announced that ‘American Jazz’ will be the name of its third new ship in its Modern Riverboat Series. The American Jazz will be slightly larger than both the first and second ships in the series, and it will feature the same advanced opening bow and retractable gangway seen on American Song and American Harmony, the company said. 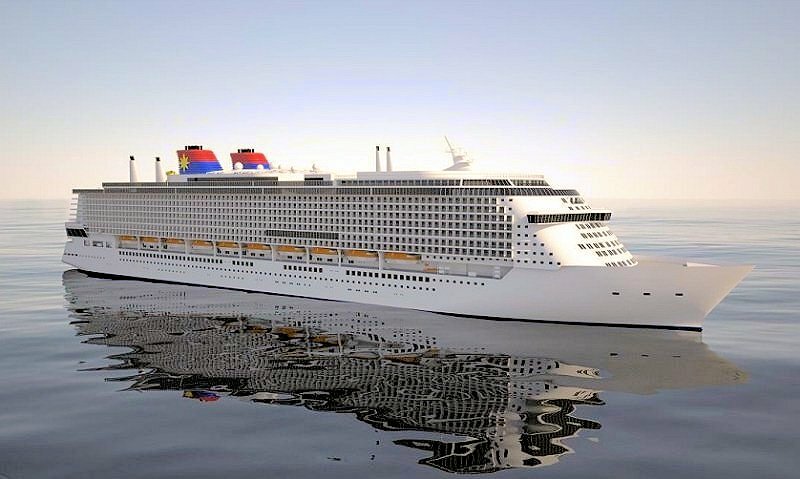 The new ship is well under construction at Chesapeake Shipbuilding in Salisbury, MD and is on schedule to begin cruising the Mississippi in 2020. American Cruise Lines has five modern riverboats planned for the series. The American Jazz will have the unique opening bow and retractable gangway featured on each of American’s Modern Riverboats. While work is underway on American Jazz, sister ship American Song is already sailing itineraries out West on the Columbia & Snake Rivers and American Harmony begins cruising the Mississippi River in August, according to a company statement. These days, many new ocean ships are similar to each other and many new river boats, especially European ones, are very similar to each, if not almost identical. In fact some ocean cruise brands actually have the same design of ship/boat as each other. Often only the livery and decor distinguishes them, from each other. Carnival in particular share ship designs between many of their brands. Likewise many new river boats for different river cruise brands actually come form the same ship yard, with the same basic design. However the ‘American Queen’ is a totally unique design when compared to nearly all other vessels in the world! The American Queen is the biggest paddle-steamer ever constructed. She has a real paddle-wheel and a real steam engine. Internally she feels like a small cruise ship and nothing like a European river boat, for example. Her decor makes her feel like a Victorian steamboat from the golden era. 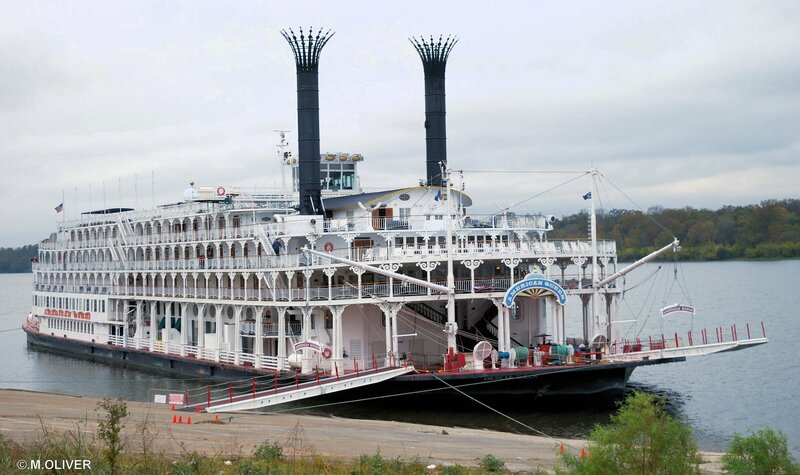 The American Queen can be found cruising on the Mississippi and other great American rivers. The phrase “Eat my hat” springs to mind. I admit it, I never thought that there would ever be a QE2 hotel. I though it was just a pipe-dream. However the QE2-Dubai opened for business about a year ago, in April 2018. Her exterior now looks fabulous as does the images of the new cabins. (I am told that they are NOT just renderings). The QE2 Ocean Liner has been docked in Dubai’s Port Rashid, since 2008, after the original plans for a hotel on board fell through. The ship has a rich nautical history after she was launched by the Her Majesty the Queen, for Cunard, in 1967. However the Telegraph reported that the vessel had become “mouldy” and “filthy” during her time in retirement. Then in 2017, Dubai-based construction company Shafa Construction announced it was going to give the classic ship a refurbishment and launched a web site. It promised “a new take on hospitality” as well as “a royal experience”. Of course I took this with a pinch of salt – how wrong was I? How Much To Stay On-board? I looked at the prices last year. Of course the prices vary with cabin grade, date and occupancy, as with all hotels. I searched for a ‘room’ (they are calling them rooms) for Saturday 28/4/18, one night, two persons. The QE2-Dubai web site gave me six grades of cabin: ‘Standard’ through to ‘Deluxe’. These were priced 955AED (£183, $260) to 1394AED (£268, $379)respectively. I guess that is the going-rate for a luxury hotel in many parts of the world, although this is of course a very unique one. I’ve not had time to see if the rates have risen much in 2019 (or dropped). Feel free to tell me! Of course I never wanted to see the QE2 scrapped but old ships often don’t tend to have much of a future. The QE2 is an out-dated vessel by modern cruise ship standards. She was when Cunard retired her. In addition Dubai is full of many impressive hotels and I believe the QE2 is quite isolated, in terms of her location, within a dock. I assume that you will probably get a bigger (more modern) hotel room in a conventional hotel and extensive facilities (maybe a resort) for the same price, as a more modest room and modest facilities, offered by an ageing ocean liner. The problem is that if they have upgraded the QE2’s accommodation and public rooms too much, she is no longer the QE2. It must be difficult to combine the concept of a museum-ship and a hotel-ship. I’ve not visited her, but the images of public rooms, cabins and deck that I have seen so far, look pretty good. Hotel-ships traditionally struggle to be profitable (It must cost more to maintain a floating hotel than a land based one, for example). The original Cunard ‘Queen Mary’ (in Long Beach, USA) is still a wonderful Ocean Liner but a very mediocre hotel. The SS Rotterdam is still a wonderful ship too, renovated with much taste, but only ship nuts would probably want to stay on her. Mind you, I did. I genuinely wish the QE2 Hotel every success, but I am still sceptical about her long term viability. However a year on, they seem to be doing a great job of promoting her. Southampton’s Ocean Cruise Terminal’s has undergone the first phase of a multi-million-pound upgrade. It’s reopening marks the beginning of a busy cruise season as it welcomed P&O Cruises Azura. Phase one has included infrastructure upgrades on the quayside with 18 new 150 tonne bollards replacing the old 50 tonne bollards. The inside of the terminal has also been significantly improved ready to accommodate an increase in passenger capacity. The project will complete in early 2020 with the installation of two new air-bridges and a further 2,000 roof-mounted solar panels. Southampton will be Iona’s home port. She is the first of two new ships of the XL class for P&O Cruises, with the next ship on order to be delivered in 2022 and is the first British cruise ship to be powered by LNG. My Worst Cruise Meal Ever! I had my worst cruise meal ever on-board Royal Caribbean’s ‘Anthem Of The Seas’ in 2015, when she had just entered service. Wonderland is an intimate dining room which carried a surcharge of £26.50 ($40 approx.) per person, at the time. The room has a charming whimsical design. However it was not some much a ‘dreamscape’ as a ‘nightmare’. I should have realised that I was about to experience something scary, when I noticed that the muzak being played in the restaurant, was the theme tune to the movie “Friday 13th”! ‘Wonderland’ should be renamed ‘Marmite’, as some passengers love it and others hate it. Food is incredibly subjective and the internet is already full of some very positive reviews of wonderland, but this is NOT one of them. I thought that I was quite adventurous with my food, but Wonderland took me to uncharted territory, which I did NOT enjoy. The culinary experience starts with a blank menu which you are required to paint with water to reveal the food. The menu contains little food that one would recognise, which should all be part of the fun. However I did not get to choose the dishes at all, the waitress just brought me a selection. 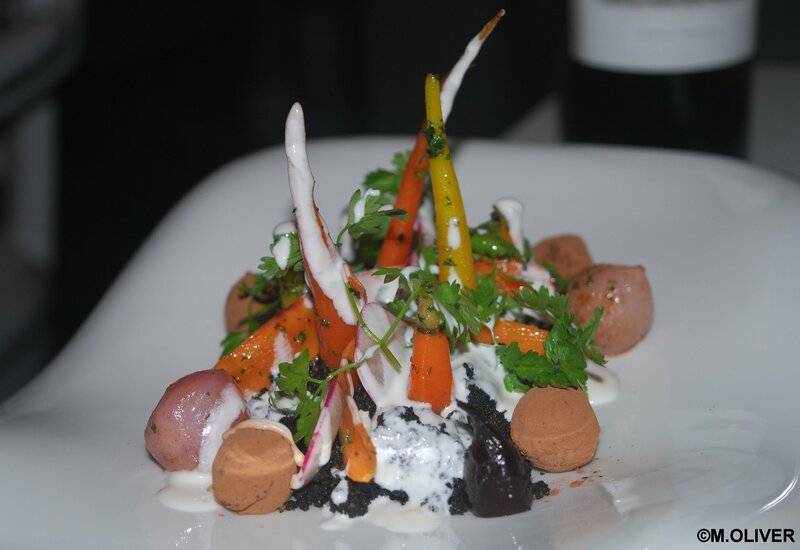 One of the early dishes was “baby vegetables in the garden”. It actually looked amazing, like vegetables growing in soil. However the vegetables were tasteless and the ‘soil’ component tasted like what I imagine soil might really taste like – yuk! I did not finish it and very few of the other diners appeared to finish it either. 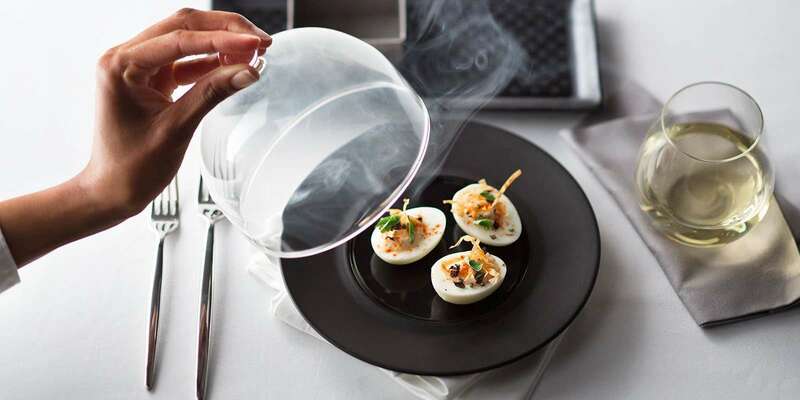 ‘Buffalo Chicken Eggs’ were cold Boiled eggs, served in a cloud of nitrogen. They had an intense charcoal taste, like breathing in a bonfire and just made me gag. I was actually beginning to dread the waitress bringing out each new course. I began fantasizing about pizza and was getting very close to walking out. In a regular restaurant the staff will normally ask you once: “Is everything OK”. In wonderland they were much more specific and repeatedly asked me: “Are you enjoying the food”. I could see in the waitresses’ eyes that she was dreading my response. My reply was: “Well it’s very different and I would not call it enjoyment”. The ‘slow roasted chicken’ looked unconventional and tasted very bland, but at least it did not actually taste bad or weird. Towards the end of the meal, the thought of a ‘sweet’ began to fill me with dread. In short, this was the worst meal that I have ever had afloat. In fact it is probably one of the worst meal that I have has anywhere. It was a total waste of £53.10p. If they had served me with KFC or McDonald’s, it would have been more preferable. I really regretted that I had not chosen to visit the buffet instead. Q: What was your worst cruise meal? Tags: Anthem of the Seas, Wonderland. Virgin Voyages has announced on a new music experience on its first ship Scarlet Lady, sailing from Miami in April 2020. The Scarlet Lady will be equipped with an on ship record shop called Voyage Vinyl, The Groupie, a private karaoke and gaming lounge, and curated music and performances by up-and-coming artists as well as music trendsetters. Virgin Voyages’ residency program will feature performances by world-class talent on ship, in-port destinations and at The Beach Club at Bimini. Virgin previously announced that the Grammy and Oscar-winning DJ, songwriter and record producer, Mark Ronson, has committed to four performances at The Beach Club at Bimini in 2020. Based on demand, the company has expanded the residency music line-up to include the multi-platinum chart-topping artist, DJ, producer/ remixer, MK (Marc Kinchen), who has committed to one performance in 2020. The Grammy-nominated electronic music duo Sofi Tukker, known for their smash-hit Best Friend, will also join the Virgin Voyages residency program. The brand also announced the expansion of their Creative Collective from design, food and entertainment to now include music, working with some of the “most creative and transformative” artists in the industry. There will also be Voyage Vinyl, the record shop aboard Scarlet Lady. The Voyage Vinyl will be the go-to spot on-board for guests to experience music from all eras and genres. Voyage Vinyl features personal listening stations for passengers to enjoy their favourite albums both current and classic. Sailors can let loose at The Groupie, Virgin Voyages’ bookable karaoke, gaming and movie lounge. Designed by Roman Coppola, The Groupie was designed as a modernist take on a Japanese-style karaoke room for Sailors to enjoy singing along to their favourite tunes with friends. It’s quite amazing how big many of today’s cruise ship are. However most of the future newbuilds will be even BIGGER. 200,000+ gross tonnes will not be unusual, within five years. Remember the RMS Titanic was only around 45,000 gross tonnes. We will see many new ships carry in excess of 6,000 passengers. The ‘official’ way of comparing a ships sizes is ‘Gross Tonnage’ which is a measurement of internal volume, not weight. However occasionally the layman (and the Press) talk about the biggest ship being the one that carries the most passengers. This is a little misleading as the ‘Oasis class’, for example, is the biggest ship in terms of gross tonnage, but there will be slightly smaller ships in the future, which will cram more passengers on-board. (Please note that some of the figures below are based on rather sketchy details about some newbuilds). 230,000 GT (estimate): Symphony of the Seas, 2018, unnamed Oasis class ship, 2021. 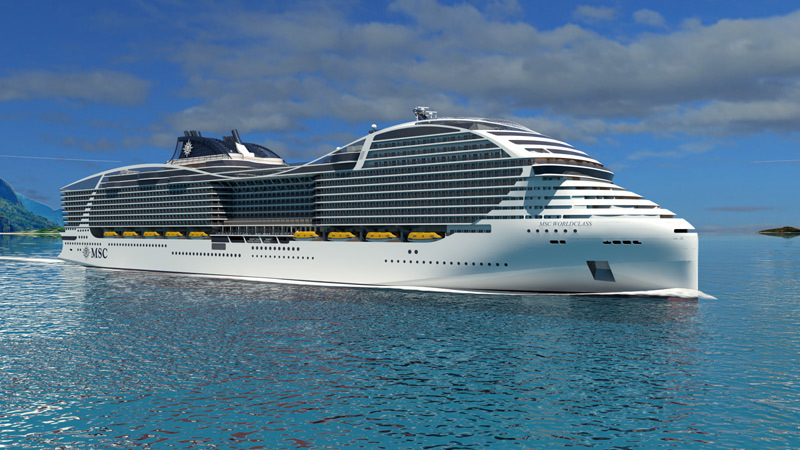 204,000 GT (estimate): “Global Class”: 2 Genting/Dream Cruises ships, 2020 & 21. 185,000 GT: Carnival brands, 6x ships, 2019-21. 168,666 GT: RCI’s Quantum Class Ships . 6,870 passengers: Symphony of the Seas, due in 2018. 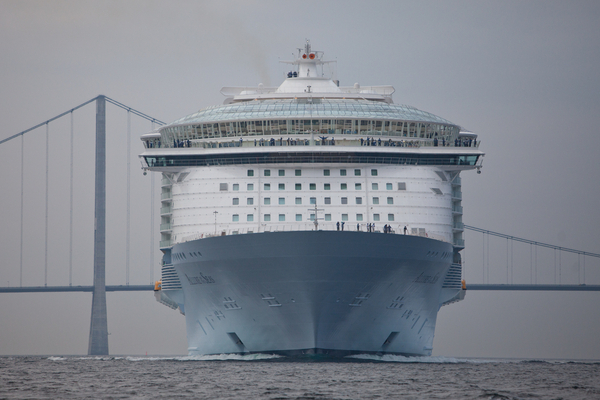 6,850 passengers (estimate): 4 MSC “World Class” ships, 2022 & 26..
6,780 passengers: Harmony of the Seas (In service). 6,600 passengers (estimated): Carnival brands, 6 ships, 2019-21. 6,360 passengers: An unnamed RCI Oasis class ship, 2021. 6,296 passengers: Allure of the Seas and Oasis of the Seas (In service). A total of 17 ships which will accommodate at least 5,000 passengers are currently under construction. The 200,000-square-foot facility will serve both new and existing shipboard team members across the company and will provide training for various onboard service areas. The facilities have been designed to provide trainees with realistic work and living experiences aboard a cruise ship, which will include replicas of staterooms, galley, casino floor, full service bar as well as safety and security training areas. the center will provide annual training for as many as 8,000 shipboard team members each year. The Canaveral Port Authority (Florida, USA) and long-time cruise partner Carnival Cruise Line have broken ground for on the new Cruise Terminal 3 complex, during a space-themed ceremony. The event theme, Go for Launch, was a nod to the Port’s key role with the US space programme and the terminal’s futuristic design, which was inspired by nearby Kennedy Space Centre. The new ‘Costa Smeralda’ has been floated out at the Meyer Turku shipyard in Finland. The LNG-powered ship is set to enter service, later this year, for Costa Cruises in the Mediterranean. the outfitting phase of the ship’s construction, has now began. “With LNG fuel technology, Costa Smeralda represents a major innovation for the international market and an important step toward setting new standards for the entire sector. Costa Group is the market leader in Europe and China, and we continue to make sustainable tourism a key part of our industry leadership,” said Neil Palomba, President of Costa Cruises. MSC Cruises and Fincantieri have announced the signing of the final contracts for the construction of four luxury cruise ships. All four vessels will have gross tonnage of approximately 64,000 tons each. Each ship will have 481 guest suites, and will showcase a highly-innovative design and introduce ground-breaking options for guest comfort and relaxation, Fincantieri stated. This announcement follows the initial signing of a memorandum of agreement between the two parties in October 2018. The first of the four ships will be delivered by Spring 2023. The remaining three will come into service one per year over the following three years through 2026. Carnival Cruise Line has unveiled stateroom designs for the Carnival Mardi Gras, which will to enter service in August 2020. Distinguished by muted turquoise hues, the staterooms’ are enhanced by design touches that include: Floor-to-ceiling glass sliding doors on nearly all verandahs for easier balcony access; new sofas that “flip” into a bed and foot stools that open up for storage; clear glass doors on the in-room mini-refrigerators to see what’s inside; more power outlets and USB connections both on the vanity and by the bed, as well as more shelf space to accommodate electronic devices; flexible bedside reading lamps that allow guests to read without disturbing others; a larger, customizable wardrobe with two pull-out bins, a sliding shoe rack, folding shelves and storage under the bed for luggage. Spacious bathrooms feature glass shower doors, a first for the line, along with an in-shower shaving bar. The Mardi Gras will offer the widest variety of accommodations of any Carnival ship with more than 70 percent of staterooms featuring an ocean view or balcony, along with 300 pairs of connecting staterooms, for large families or groups. In addition to the newly redesigned staterooms with more balcony, ocean view and interior choices than ever before (for Carnival), the Mardi Gras will also offer features introduced on Carnival’s Vista-class including: The tropics-inspired Havana staterooms feature vibrant interiors and an outdoor patio space. These staterooms have access to an exclusive open deck with sun loungers, Cuban-themed bar and relaxation pool. Extra-roomy Family Harbor accommodations will have a nautical décor and are located near Camp Ocean, the children’s facility, and have access to the Family Harbor Lounge. 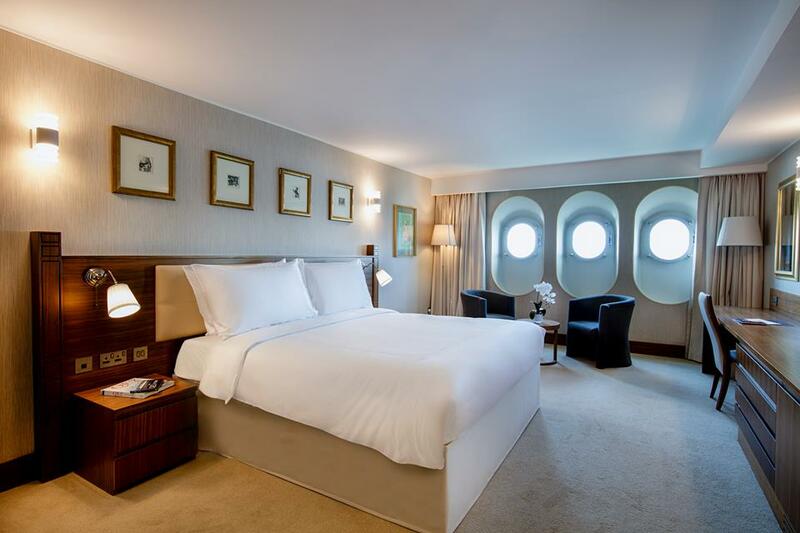 Cloud 9 Spa staterooms feature exclusive, soothing décor, spa bathrobes and slippers as well as Elemis toiletries. These accommodations offer privileges to the ship’s spa. The Mardi Gras will also offer the most suites of any Carnival ship, a total of more than 180 of varying size and locations. Malcolm says: New design? Sorry to be a killjoy but the cabin rendering above looks the same as any standard cabin on any new mass-market ship – attractive but a bit narrow! Seabourn has announced that it will name its first new ultra-luxury purpose-built expedition ship Seabourn Venture. The cruise line said the name is paying tribute to the remote destinations visited by the brand’s expeditions and Ventures by Seabourn excursion programs and the places yet to be explored in the future. Seabourn began offering expedition experiences during its first sailing to Antarctica in 2013. That program has since opened the door for similar optional experiences under the name Ventures by Seabourn featuring Zodiacs, kayaks, and guided hikes offered on Seabourn ships in a number of destinations around the world, including Alaska, Australia and New Zealand, South America, and Northern European destinations such as Norway and Greenland. Currently under construction at T. Mariotti Damen, the Seabourn Venture is scheduled to launch in June 2021, with a second yet-to-be-named sister ship slated to enter service in May 2022. Both ships will be designed and built for diverse environments and to PC6 Polar Class standards and will include hardware and technology that will extend the ships global deployment and capabilities. The new ships will carry two custom-built submarines onboard. The ships will also be designed to carry a complement of kayaks and 24 Zodiacs that can accommodate all onboard guests at once. Each ship will feature 132 oceanfront veranda suites. Dream Cruises and Genting Cruise Lines have unveiled the hull art for the Explorer Dream, which is currently being converted to Dream Cruises service from her previous career as the SuperStar Virgo. Huang’s fresh, new take on the myth of the mermaid sees a softer, almost impressionistic, approach to the depiction of this iconic figure and also introduces the dream-like figure of the unicorn to further personify the spirit of exploration and discovery, the company said. The ship will be based in Shanghai and Tianjin for the spring and summer before transiting to Australia and New Zealand for winter 2019-2020. A while back I found myself walking past the ‘Suborn Yacht Hotel’, London, and I decided to take a quick look inside. The Hotel (Yacht) opened in June 2014 and is located on the waterfront at the western end of the Royal Victoria dock. It is within a very short walk of the main entrance of the ‘Excel’ Exhibition Centre. There are a number of ‘Sunborn’ static yachts around the world. I travelled across the Thames to The Royal Victoria dock, from North Greenwich (near the O2 Arena) via the Emirates ‘Air Line’, London’s only cable-car (in fact it’s a gondola). It’s a very spectacular ride and well worth experiencing. (See my slide show below). There was initially a lack of hotels in this area of London, hence the Yacht Hotel. Curiously there are a number of hotels nearby now, so the yacht has much competition. The yacht is NOT a real ship. Yes it really floats, but it was purpose built as a hotel. It has no engines or navigational bridge. It was actually towed into position by tug. As you enter by a lift (elevator), you walk straight into a very glitzy reception area with a reception desk and a double curved staircase to the upper decks. There does not appear to be many public rooms. There would be more on a ‘real’ ship. However there is of course a bar/restaurant with a lido deck on the stern where you can eat and drink, overlooking the Royal Albert dock. Sunborn describe the facilities as follows: “The 4-Star deluxe yacht hotel has 136 spacious guest rooms over 5 floors including 4 spacious suites, along with an elegant reception area, bar and lounge, fine-dining restaurant, banqueting facilities, auditorium, conference rooms, and a three-level event venue with outdoor terraces facing towards Canary Wharf” . I was unable to see the accommodation, however I have seen some renderings of the rooms. 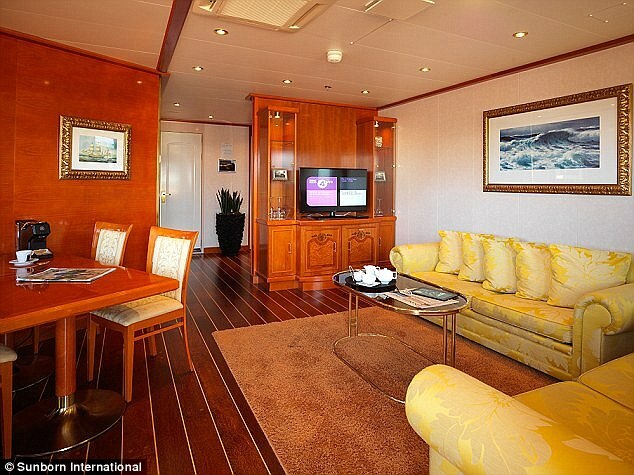 Although they look rather nice and spacious, they do not look like a ships accommodation, they look like hotel rooms. In fact the whole feel of the Yacht to me as a ‘ship enthusiast’ was one of a ‘fake’ ship. The less nautical person would probably not notice. I am not suggesting that Sunborn Yacht Hotel does not provide good accommodation and a good experience. Although I have not stayed on-board, there are many very positive reviews on TripAdvisor. However I have seen room rates from £140 (off-peak) to £750 per room, per night, depending on grade and date. A price of around £200+ looks to be more typical, which is hardly cheap for a four star establishment, although I guess that you are paying for its uniqueness and prime location. Cruise ships often have more impressive décor than most shore-side hotels and buildings. Many ships also have impressive art collections on-board. Some ship even have art work on the deck and/or have impressive hull-art. How important is a ships décor really is to the passenger experience? Cruise lines obviously think that the décor is VERY important, given the fact they spend millions of pounds/dollars/Euros on it. They also regularly undertake refurbishments, re-styling the decor. I’ve certainly been on-board ships where I have loved the décor . I’ve also been on-board ships where the décor has not generally been to my liking. However sometimes different public rooms are created by different designers, so it is very possible to love some rooms, think some are mediocre and dislike others – all on the same ship. There certainly used to be a different between UK and US style décor on-board ships. For example P&O ships décor was regarded as rather tasteful, reflecting the British ‘reserve’, when compared to the Las Vegas ‘glitz’ of many American ships. However by American tastes it was understated’ or even bland. Since Carnival acquired P&O and provided new mega-ships, we have seen a much more vibrant American style décor for British passengers. There have also been frequent visits of big US ships to UK ports, for some years, offering cruises for Brits. Therefore I believe the British cruising public are getting acclimatised to a more bold colour schemes American glitz. 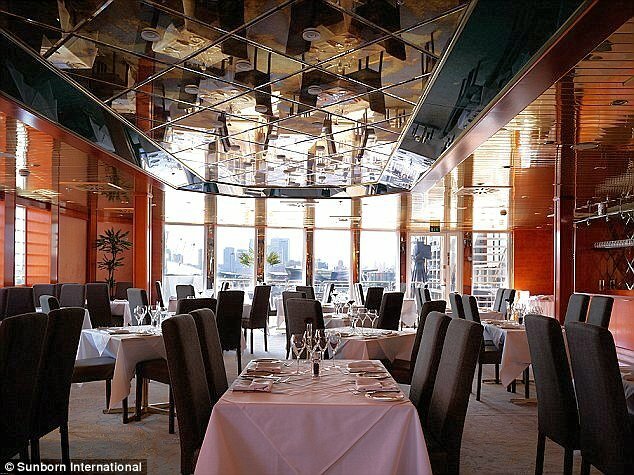 Joe Farcus, the American Navel Architect, has designed some mind-blowing interiors for Carnival and Costa ships. He calls it ‘Entertainment Architecture’. It’s very original, very colourful and often very loud. It’s Las Vegas ‘Glitz’ on steroids, with maybe a dash of psychedelia. His work is definitely not to every-bodies taste. Décor and ‘taste’ changes over time, of course. I think the pure-glitz is going out of fashion and is being replaced with a more sophisticated cappuccino-café style, as I call it. For example the ‘Norwegian Cruise Lines’ (NCL) ships built between 2001-2007 (Star, Jade, Gem etc.) all had very colourful décor in places, not unlike Farcus’s work. However during NCL’s ‘Norwegian Edge’ which was a $400 million revitalization program of their fleet, the décor was updated. For example, the image above is Norwegian Gem’s original Atrium’s décor. Below is the refurbishment, which less over-the-top and more sophisticated. So how important is the décor to you? Have you been on board a ship where the décor was not to you liking? Do you love some ships décor? Please tell me. Cunard has unveiled their Oceans of Discovery voyage program for November 2020 through May 2021, featuring Full World Voyages and in-depth itineraries in Japan and Australia. The Cunard fleet, including Queen Elizabeth, Queen Victoria, and the Queen Mary 2, will call at 94 destinations in 38 different countries, including four maiden calls in Japan, Taiwan and New Zealand. In 2021, Cunard will continue the tradition of world cruising by operating world voyages on two ships: the Queen Mary 2 will offer the classic East-West voyage to Australia and Asia, Southern Africa, the Indian Ocean, Arabian Gulf and the Mediterranean; the Queen Victoria will travel the globe with a westbound circumnavigation via the Panama Canal. The Queen Elizabeth will carry out exotic voyages with regionally-focused itineraries in Australia and Japan. • Grand Voyages, by Cunard and Regions, by Cunard. On 28th February, 2019 the new Costa Venezia was officially delivered by Fincantieri. Now the Costa Venezia has officially been named during a christening ceremony in Trieste, Italy. The day began with an display by the Pattuglia Acrobatica Nazional acrobatic flight team over the port of Trieste, flying over the ship in tight formation. The President of the Friuli Venezia Giulia Region and the Mayor of Trieste involved the Italian Air Force, and the show was visible for multiple parts of the city. The godmother was Gan Beiye along with family, which were described as big Costa fans since their first cruise in 2011. The day ended with a midnight fireworks celebration accompanied by music. At 135,500 tons and 323 meters in length, the Costa Venezia will be the biggest ship introduced by Costa to the Chinese market, where the Italian company was the first to start operating in 2006. On March 8, the ship will be back in Trieste for the start of its inaugural cruise: a 53-day trip following the tracks of Marco Polo through the Mediterranean to the Middle East, South East Asia and the Far East before docking in Tokyo. The ship starts her China-based program from Shanghai on May 18. After a short Europe program, the Venezia will sail for Asia and start her China-based program from Shanghai this May. Viking Cruises will launch its expedition program in 2021 as the first of two newbuilds will join the company’s fleet. The new vessel series will fall under the name Polaris class. The ships will feature a number of standard expedition amenities, including zodiacs, but will also have submarines aboard and carry a 20-person expedition team, which is slightly larger than the expedition staffs on other cruise vessels. A vessel size has yet to be revealed, but steel cutting is expected to take place later this year for the first ship, which will be built by VARD. It is expected that the ships are dual-fuel, capable of running on LNG. Viking will base its expedition operation out of an Oslo office. Tendering (the process of a cruise ship berthing at anchor and using small ships to transport passengers to ashore) can be quite fun. That is assuming that the sea conditions are not too rough which can not only make tendering uncomfortable, it can make it impossible. Tendering is also a great way to get some good images of a ship. Above is a short slide-show of images, taken by myself, of CMV’s Astor during an around Britain cruise. The eagle-eyed will see that the ships lifeboats are NOT being used for the tendering, in the earlier images, but several larger (open) boats from the shore are. This of course increases the speed of the process. The latter images are from a different tender port and ARE using the ships lifeboats (orange). Hurtigruten’s new advanced 530-guest Roald Amundsen has successfully completed its first set of sea trials off the coast of Norway over the weekend. With Norwegian fjords as testing ground, the Roald Amundsen’s advanced battery technology was put to a test in the waters off Kleven Yard in Ulsteinvik. Custom built for some of the most extreme waters on the planet, the Roald Amundsen is currently undergoing final outfitting alongside her sister ship MS Fridtjof Nansen at Kleven Yard in Ulsteinvik, Norway. After delivery this spring, the Roald Amundsen’s maiden season includes expedition cruises along the Norwegian coast, to Svalbard and Greenland, before traversing the legendary Northwest Passage and heading south to Antarctica. The Hurtigruten exploration Ship, Roald Amundsen, will debut the tallest LED screen at sea when she debuts later this spring for Hurtigruten. Spanning seven decks and being 17.5 high and 6.5 meters wide, the screen located in the ship’s atrium will give the guests a truly unique welcome when they step on board MS Roald Amundsen – the world’s first hybrid powered cruise ship. The screen will be located to face the three all-glass elevators. Featuring cutting-edge LED technology, the screen will provide a resolution beyond 4K Ultra-HD, with perfect seamless and borderless display. The Norwegian company, Hurtigruten has now released some renderings of the public rooms and cabins on-board their forthcoming ‘Explorer’ ships. Construction has begun of the first ship, named after the Norwegian polar explorer, Roald Amundsen. The ship will enter service in summer 2018. A sister ship, Fridtjof Nansen (also named after a Norwegian polar explorer) follows in 2019. The company has an option for two additional 20,000-ton, 600-passenger vessels. The new ships are designed by Rolls-Royce, in collaboration with the Norwegian yacht designer Espen Øino. Six out of ten cabins will have their own balcony; two out of ten will be suites. The vessels will have three restaurants with menus reflecting local flavours and destinations. The cost of the ships is estimated at $220 million each. The vessels will be the first cruise ships in the world to utilise hybrid power using a battery system. Malcolm says: The expedition cruise ship market is booming. There have been orders from a number of existing cruise lines and one new market entrant placed since last March 2016. There are at laest 12 orders which include Hurtigruten (2 ships + a possible 2 more), Oceanwide (1 ship), Hapag-Lloyd (2 ships), Ponant (4 ships), Crystal (3 ships) a new market entrant (1 ship). Airbus has blamed weak sales for its decision to scrap production of the A380 superjumbo – the world’s largest airliner, the double-decker. The European aerospace giant has confirmed that it would deliver the final aircraft, with its two decks of cabins and room for 544 passengers, in 2021. Malcolm: Imagine flying to board the world’s biggest ship (Symphony Of the Seas) on the worlds biggest aeroplane! Mind you, it’s not likely to happen as I believe that the A380 is not used on routes to Miami. Royal Caribbean Cruises announced on 19/02/19 that it has entered into an agreement with French shipbuilder Chantiers de l’Atlantique to order a sixth Oasis-class ship for delivery in the fall of 2023. The sixth Oasis-class cruise ship, will also be the biggest cruise ship in the world when she debuts in 2023. The ship design will expanding to 231,000 gross tonnes, compared to the first in the series, 2012 built ‘Oasis of the Seas’ at 225,282 gross tonnes. The number of staterooms will also increase: 2,857 cabins, for a double occupancy of 5,714 guests. By comparison, the Oasis has a double occupancy of 5,400 passengers. The ship has yet to be named. The first two Oasis-class ships, the Oasis and Allure, were built at STX Finland (now known as Meyer Turku). The next series of ships has been constructed at what is now Chantiers de l’Atlantique in France. Malcolm says: There is no other design of ship quite like the ‘Oasis’ class. It is remarkable. Oasis is also considerably bigger than many of the new ships carrying a similar number of passengers (5,000 ish) which actually make her pretty spacious. So what is a Princess cruise like? Princess Cruises are a well respected American cruise line, which was formed in 1965. They currently have 17 big ships, with five more on order (see news below). Sapphire Princess (2004) at 115,875 gross tonnes, carrying 2,670+ passengers, is representative of their ‘Grand Class’ ships. Most of the Grand class were built by the Italian shipyard, Fincantieri, but two: ‘Sapphire’ and ‘Diamond’ were built by Mitsubishi Heavy Industries, Japan. They both are fractionally larger in terms of GT (about 3,000), than the rest. The ‘Grand Class’ was a very successful class of ship. It evolved into the ‘Gem’, ‘Caribbean’ and ‘Crown’classes, which had enhancements, including some having an extra deck. Nine ships were built between 1998 to 2008. However another Carnival brand, ‘P&O’, received two ‘Grand Class’ variations, called the ‘Ventura’ class: ‘Ventura’ (2008) and ‘Azura'(2010). Princess Cruises has celebrated significant milestones for each of its three ships currently under construction. For Sky Princess, which will launch in October this year, a Madrina ceremony was held. The ceremony saw Kerry Ann Wright, a Glasgow-based second officer for Princess Cruises, wish the ship a safe onward journey with a blessing at the shipyard. Wright began her career at sea working in the onboard hotel department before beginning her own deck cadetship. For Enchanted Princess, which is due for completion next year, a keel laying ceremony took place. Following a traditional blessing, executives from Princess Cruises and Fincantieri kicked off the countdown to completion of the fifth Royal-class ship by ceremoniously lowering a 500-tonne keel – the bottom-most part of the ship – into position in the drydock. Representatives and invited guests then participated in a traditional good luck coin ceremony, which comprised welding an Ocean Medallion into the ship. Enchanted Princess will launch in Southampton in June 2020. Finally, a steel-cutting ceremony was held for the final Royal-class ship. The ceremony took place during a live broadcast from Naples, Italy, and marked the cutting of the first plates of steel. These signalled the beginning of construction of the ship scheduled to launch in 2022. With two further ships on order for delivery in 2023 and 2025, Princess Cruises will increase its capacity by 32 per cent over the next six years. Malcolm says: By the way can you see the silhouette of the ‘Sea Witch’ and her flowing hair, on the hull? It’s obvious when you know. The ‘Blue Star Line’ has contracted Deltamarin to continue with the design of Titanic II. The contract covers activities and tasks for the design process, consultancy and project management services. The Titanic II project went very quiet over Christmas 2018 and the New Year. Radio silence has continued into February 2019. However in January 2019, Deltamarin, said: “Our target is to finish the project development phase during Q4/2019”. So some good news on the progress of the project. If readers are wondering why I am providing so much ‘Virgin Voyages’ news, it is simply because Virgin are the main company generating it at the moment! Virgin Voyages has announced that the Scarlet Lady will feature a festival of choice in entertainment made up of bespoke intimate and authentic Events & Gigs created exclusively for Virgin Voyages with the goal of providing guests with an alternative perspective on the world and play that ignites the spirit within. Virgin said guests wouldn’t just sit and watch shows, but instead may be asked to participate with the cast. The company will have no traditional cruise director onboard the ship, and instead it will have a dynamic group of individuals dedicated to making “Happenings” around the ship completely epic, Virgin said. Virgin Voyages has created The Red Room as the first transformational multi-form theater at sea. It will transform into four different configurations – including traditional Proscenium stage, to alley stage used in fashion shows, to a dance flat-floor configuration and finally a unique reverse stage setup. Malcolm says: Well the words sound good: “bespoke intimate and authentic Events & Gigs”, “happenings” and “off-the wall participatory acts”. However I can’t help thinking that RCI, NCL and MSC have offered most types of entertainment already. To truly offer something ‘new’ will be difficult. However let’s not be cynical, I will give Virgin the benefit of the doubt and look forward to the first passenger reviews. Virgin Voyages first ship the Scarlet Lady, now open for bookings for her inaugural season with voyages departing from April 1 through to October 25, 2020. Virgin Voyages also revealed that all voyages will feature The Beach Club, a Virgin Voyages experience in Bimini, Bahamas. Just a short transfer from the pier, and built in partnership with Resorts World Bimini, The Beach Club at Bimini is designed with Miami-based architects EOA, Inc. featuring natural materials and soft earth tones that organically blend into the seascape. The Beach Club will overlook the ocean and cascade down to the sea with an expansive lagoon-style pool as the central anchor of the club. Mornings at The Beach Club will begin with yoga and meditation. The energy at The Beach Club will gradually be amplified as the day progresses and turned back down as dusk settles in. Sailors will reach the high point of the day by the afternoon where DJ-led pool and floatilla parties will be center of the action, the company said. The night’s energy will wind down with a beach bonfire to close out the evening with an acoustic musical performance. The Beach Club at Bimini, will also have complimentary food that is thoughtfully sourced. Its locally inspired menus will serve up island favorites such as conch and mango salad, banana leaf-wrapped queen snapper, Bahamian rum cake and more. In addition will be six bars, many beach loungers and beach side and poolside cabanas available for rent. The Beach Club will also feature active areas for watersports and beach play. RockStar Suites guests will have their exclusive slice of paradise at The Beach Club at Bimini, with a dedicated bar, complimentary food service, an outdoor terrace lounge, sun loungers and beach cabanas. Virgin Voyages has announced that Sir Richard Branson will celebrate his birthday among celebrity friends and fellow guests aboard a four-night Havana After Dark voyage departing on the new Virgin Scarlet Lady from Miami on July 15, 2020. Virgin said it is inviting passengers to book their cruise by visiting the Virgin Voyages website. The Celebrity Millennium is back in service following a massive. The 2000-built ship is now sporting her new colour scheme, in line with the new Celebrity Edge. The $500 million fleetwide upgrade project to bring a number of features back across the Millennium- and Solstice-class ships, including Celebrity’s Retreat concept. All staterooms now feature a new design. The Qsine (restaurant) will be added across the fleet and completely renovated, now offering the brand’s virtual Le Petit Chef experience. Oceanview Café will be redesigned with an open, airy, marketplace-inspired design, while the main restaurants will undergo a redesign. Other Celebrity Revolution features include: Expansion of the new SEA Thermal Suite; new shopping experiences with name brands and designer products; elevated bars and lounges, including the newly reimagined Passport Bar and an expansion of Celebrity’s Gastrobar concept, serving more than 40 craft beers. The revitalization will continue across the fleet, concluding in 2023. Regent Seven Seas Cruises “Seven Seas Splendor” was launched on February 9th, 2019, at Fincantieri’s Ancona shipyard. She is the second super luxury cruise ship that Fincantieri is building for Regent Seven Seas Cruises, following the 2016 delivery of the Seven Seas Explorer. Delivery of the 750-guest Splendor is scheduled for 2020. The ship is 55,000 grosse tons with capacity for 750 guests. A third vessel follows in 2023. Malcolm says: Ships used to have wonderful (and original names) in the past, such as: Leviathan, Mauretania, Caronia, Saxonia, Carinthia etc. Now the lines tend to copy each other to some extent like: “Splendour of the Seas”, “Seven Seas Splendour” and “Carnival Splendour. There are many other examples too like “Norwegian Dream”, “Carnival Dream”, “Genting Dream” and “Marella Dream” – how unimaginative! Q: Do you have a favourite ship name from the past? P&O Cruises giant new ship Iona will operate seven-day sailings from Southampton to the Norwegian fjords, in her inaugural season. The 180,000 gross tonne ship is due to commence operating the no-fly itinerary from its UK home port of Southampton, in just one years time – from May 2020. However now the cruise line has revealed the winter itineraries which will be on offer. There will be a mix of seven and 14-night itineraries including day-into-night visits on shore, so passengers can really make the most of the destinations and the local nightlife. The ports of call for Spain, Portugal and the Canary Islands including the likes of Cadiz, Fuerteventura, Gran Canaria, Lanzarote, Lisbon, Madeira, Tenerife, Alicante, Barcelona, Gibraltar, Malaga, Valencia and Vigo. The full details will be on the P&O web site. Malcolm says: The full details of the Winter itineraries have yet to be published and you can’t book them as yet. I believe the lack of availability of LNG fuel at European ports has delayed these itineraries until winter – the shipbuilding was faster than the LNG dissemination. The itineraries are pretty standard for ex-UK cruises. After all, where else could she go during 7 and 14 night, roundtrips? Virgin Voyages, The Scarlet Lady, touched the water for the first time, at the Fincantieri shipyard, Italy. The first ship from the new cruise brand will commence operation from the Port of Miami in April 2020. With the hull complete and the ship now in the water, the focus will turn to interior outfitting on the 110,000-ton, 2,770-guest ship. Virgin also celebrated the coin ceremony, for Virgin’s second ship, as yet unnamed, which is scheduled to be delivered in the second quarter of 2021. 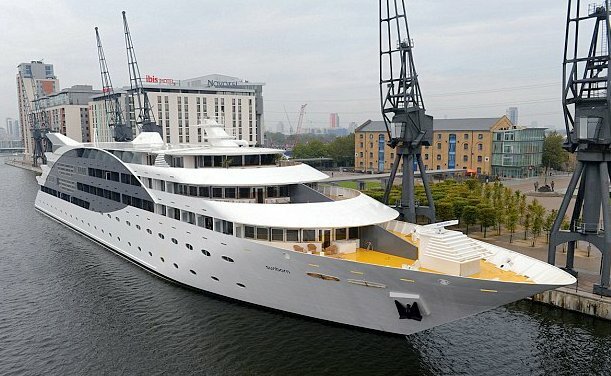 The Christina ‘O’ (1943) yacht, owned by millionaire Aristotle Onassis, was moored in London in 2012 and open to the public for a short period. John & Jackie Kennedy and Winston Churchill were regular guests of Onassis, before Jackie later married him. The Viking Jupiter, the sixth Viking Cruises newbuild, has been delivered today by Fincantieri in Ancona. The 47,000-ton ship has capacity for 930 guests and is the sixth in a series of 16 sister ships for quickly-growing Viking Cruises. Virgin To Incude WiFi, Dining Cover Charges & Grats In fare. Virgin said it will open bookings for its inaugural season of their first ship, the Scarlet Lady, on February 14, and has released a sneak peak at its booking engine online. Reservations, however, are now open to guests who put down a pre-sale deposit. Virgin is including dining cover charges and unlimited WiFi in the ticket price of its adults-only cruise, in addition to all work out classes. Gratuities will also be included in the cruise fare. Guests will be able to choose from 20 dining options, of which some will be open 24 hours per day, Virgin said. Deployment includes cruises to Cuba, Costa Maya and Puerto Plata. Additional port calls are expected to be added into each itinerary and announced this month. Malcolm says: Brits will enjoy this new trend of ‘Grats’ being included, after decades of complaints. P&O are doing the same.